As you know by now, wind is a mass of air moving over the surface of the Earth in a definite direction. When the wind is blowing from the north at 25 knots, it simply means that air is moving southward at a rate of 25 NM in one hour. Under these conditions, any inert object free from contact with the Earth is carried 25 NM southward in one hour. This effect becomes apparent when clouds, dust, and toy balloons are observed being blown along by the wind. Likewise, an aircraft flying within the moving mass of air is similarly affected. Even though the aircraft does not flow freely with the wind, it moves through the air at the same time the air is moving over the ground. 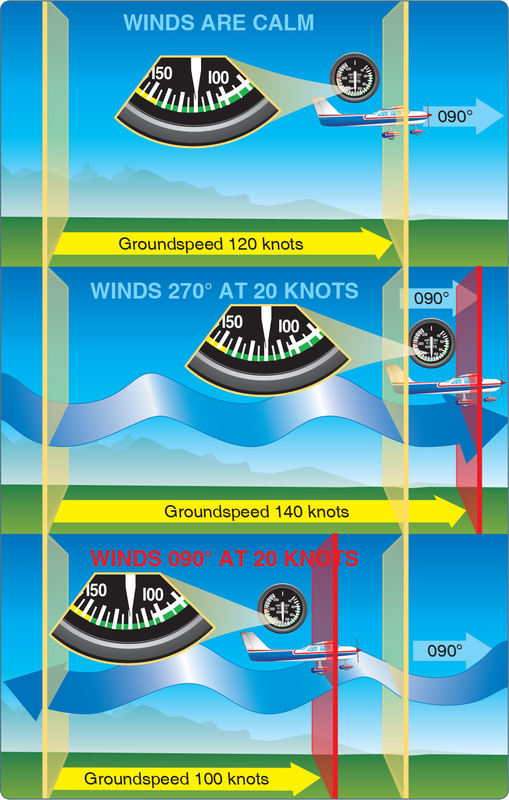 Today, we’ll discuss the effect wind has on navigation, with an excerpt from the new edition of the Pilot’s Handbook of Aeronautical Knowledge. Forward movement of the aircraft through the airmass. As shown in the figure below, an aircraft flying eastward at an airspeed of 120 knots in still air has a groundspeed (GS) exactly the same—120 knots. 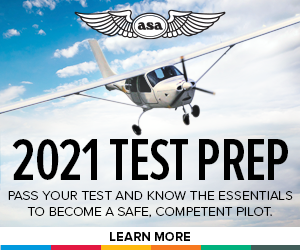 If the mass of air is moving eastward at 20 knots, the airspeed of the aircraft is not affected, but the progress of the aircraft over the ground is 120 plus 20 or a GS of 140 knots. On the other hand, if the mass of air is moving westward at 20 knots, the airspeed of the aircraft remains the same, but GS becomes 120 minus 20 or 100 knots. Assuming no correction is made for wind effect, if an aircraft is heading eastward at 120 knots and the air mass moving southward at 20 knots, the aircraft at the end of 1 hour is almost 120 miles east of its point of departure because of its progress through the air. It is 20 miles south because of the motion of the air. Under these circumstances, the airspeed remains 120 knots, but the GS is determined by combining the movement of the aircraft with that of the air mass. GS can be measured as the distance from the point of departure to the position of the aircraft at the end of 1 hour. The GS can be computed by the time required to fly between two points a known distance apart. It also can be determined before flight by constructing a wind triangle. The direction in which the aircraft is pointing as it flies is called heading. Its actual path over the ground, which is a combination of the motion of the aircraft and the motion of the air, is called track. The angle between the heading and the track is called drift angle. If the aircraft heading coincides with the TC and the wind is blowing from the left, the track does not coincide with the TC. The wind causes the aircraft to drift to the right, so the track falls to the right of the desired course or TC. 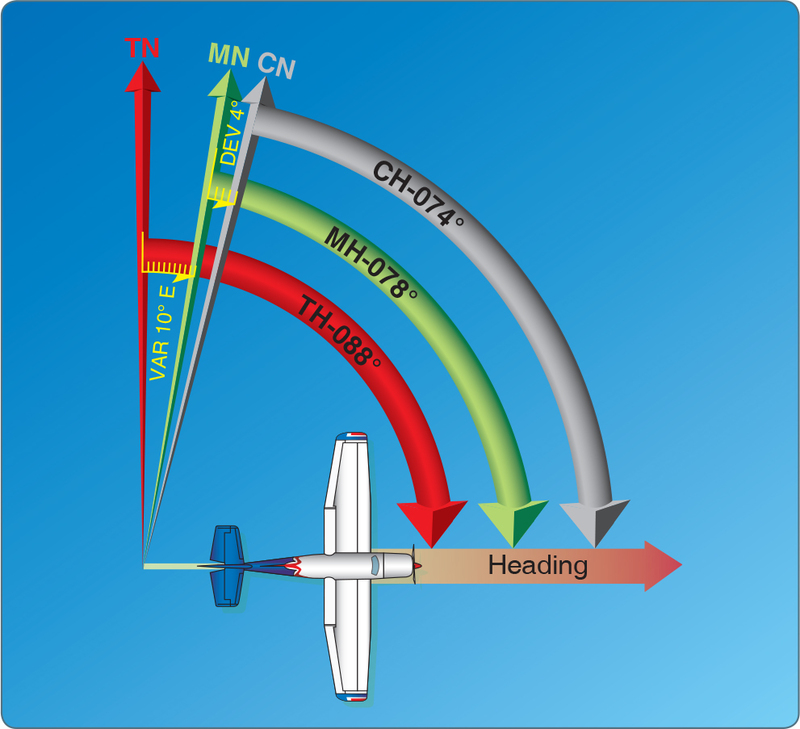 The following method is used by many pilots to determine compass heading: after the TC is measured, and wind correction applied resulting in a TH, the sequence TH ± variation (V) = magnetic heading (MH) ± deviation (D) = compass heading (CH) is followed to arrive at compass heading. By determining the amount of drift, the pilot can counteract the effect of the wind and make the track of the aircraft coincide with the desired course. If the mass of air is moving across the course from the left, the aircraft drifts to the right, and a correction must be made by heading the aircraft sufficiently to the left to offset this drift. In other words, if the wind is from the left, the correction is made by pointing the aircraft to the left a certain number of degrees, therefore correcting for wind drift. This is the wind correction angle (WCA) and is expressed in terms of degrees right or left of the TC.